Rev. Xavier Cai (Tsai), S.J., an advisor to The Cardinal Kung Foundation, was called to the Lord peacefully on June 1, 1997 in New York at the age of 90. Father Xavier was a very dear friend of His Eminence, Cardinal Kung and a hero of the loyal Catholic Church in China. He served as the pastor of the Cathedral of St. Ignatius in Shanghai during the early years of the communist regime and until his arrest on July 7, 1953. All the Catholics in Shanghai and thousands of Chinese Catholics around the world remembered Father Cai affectionately for his most inspiring sermons, his deep love for Holy Mother, and his devotion to St. Therese. Wherever he spoke, the crowds followed him enthusiastically. He inspired Shanghai faithful at a very difficult period. Father Cai practiced what he preached. He refused to join the Patriotic Association. Rather than betraying his Bishop, Ignatius Kung, and the Church, he went to jail and labor camp for 35 years. He was sentenced on the same day as Bishop Ignatius Kung. In his memoirs, he said that he was filled with the peace of the Lord during his thirty-five years of imprisonment, which included 40 days confinement in an unlighted water cell (a small, underground cell, the floor of which is about six inches deep with water, containing only a small platform on which a prisoner may sit or stand) . He completely placed himself in the boundless love of the crucified Christ. When Father Cai was suddenly released before the completion of his sentence in 1987, he was informed by the labor camp superintendent that his good behavior in the labor camp indicated that he has repented. Father lost no time in correcting him that good behavior was not the same as repentance. His position was the same, he had not repented. 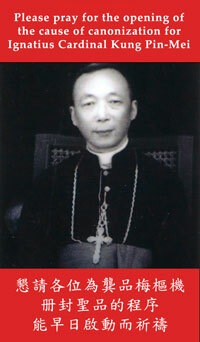 After his release, Bishop Aloyisus Jin, the P. A. Bishop of Shanghai invited Father Cai to lecture in the famous Sheshan Seminary, which was controlled by the Patriotic Association. Bishop Jin invited him to participate in other capacities with the Patriotic Association. Had Father Cai agreed, he would be handsomely rewarded as an "hero" similar to the turncoat Bishop Jin. Father Cai declined and worked among the underground faithful instead until he came to the United States. Father Cai arrived in the United States in 1987 at the age of 80. He became immediately active in the Brooklyn Diocese taking care of the Chinese faithful. His advanced age and poor health could not slow him down. He gave retreats and homilies throughout the United States, Canada, Taiwan, Hong Kong, Australia, South America and Europe. He testified for the underground Church in the Subcommittee on Human Rights of the U. S. Congress, and spoke before various Catholic and human rights organizations. He remained active until he was taken ill a few months before he passed away. We give thanks to God for Father Cai's ministry, for his heroic example, and for his deep love to the underground Church in China. He was always joyful and completely trusting in the Lord. His holiness, sincere love, and deep interest in others attracted people of all ages and all walks of life to his side. The Cardinal Kung Foundation is particularly grateful to his advice and encouragement during the past years. 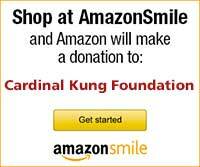 He followed the work of the Cardinal Kung Foundation closely. His enthusiasm for the underground Church is infectious. His wise counsel is sorely missed. Now without the limitation of earthly poor health and old age, Father Cai will no doubt double his effort and intercede for the underground Church at the foot of his Holy Mother. Rev. John A. Houle, S.J. In February, 1990, Father Houle was ill with terminal pulmonary fibrosis. Through the intercession of Blessed Claude la Colombiere, he was miraculously cured. This miracle was the third and final miracle necessary for Blessed Claude la Colombiere's canonization which took place on May 31, 1992 in St. Peter's Basilica presided over by Pope John Paul II. I will always remember Father Houle as a devoted priest of the Shanghai Diocese. Father Houle never forgot China and his Chinese friends. He spent four decades telling the free world about the suffering Church in China. Today, I will join all of you spiritually at the altar... in thanksgiving to Almighty God for the grace we received through Father John Houle, a loving friend, a devoted priest, and a true son in the Church of China. I am confident that Father John will continue to intercede tirelessly for the suffering Church until there is one Flock and One Shepherd in China. Please remember Father Cai and Father Houle in your prayers.